EU referendum to be held in 2016 or 2017...No, not that one! 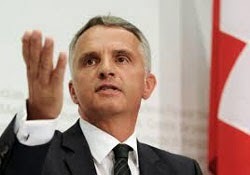 Swiss President Didier Burkhalter (see picture) has today announced that Swiss voters will be asked to vote on the future of their bilateral relationship with the EU "by the end of 2016 or the beginning of 2017." There have been long-running negotiations over the Swiss-EU bilateral deals, with the EU keen on greater supranational oversight, but these talks gained more urgency in the wake of February's referendum in which the Swiss electorate voted in favour of renegotiating rules on the free movement of persons. The result stipulated that Switzerland will have to renegotiate its bilateral accord with the EU on free movement within three years or revoke it. This in turn could threaten Switzerland's other bilateral agreements with the EU. Last week, the EU told Switzerland that it was not prepared to negotiate quotas on free movement. In other words, in that choice between accommodating Swiss demands or playing hardball that we identified back in February, the EU has definitely opted for the latter approach. Interestingly, the decision not to negotiate was apparently reached by unanimity amongst EU governments, meaning that the UK opposed allowing the Swiss to 'renegotiate'. This is awkward for David Cameron, he was left with a choice of either giving Better Off Outers fresh ammunition ("see what the Swiss can do outside the EU") or accusations of denying the Swiss a similar right to which he wants to give Britain. In addition, in that old EU tradition, the Swiss are effectively being asked to 'vote twice', with a view to them voting 'the right way' the second time around. In any case, faced with this impasse, the Swiss government's approach seems to be to put a 'take it or leave it' package to the public in the hope they vote to renew the bilateral relationship with the EU, even if this means little or no change to the rules on free movement. Given that Switzerland is already outside the EU, a rejection of the package by the Swiss electorate could see relations return to square one - what that means is anyone's guess at this stage. If David Cameron is re-elected, Switzerland's 'renegotiation and referendum' could coincide or foreshadow the Conservatives' efforts, which could be interesting. The Foreign and Commonwealth Office has published a previously confidential account of the 1974-75 renegotiation of the UK's EU membership under Harold Wilson's Labour Government. That renegotiation largely resulted in only token concessions to Britain - greater imports of New Zealand butter being chief among them. They were however enough to secure an In vote of just over 67% in 1975. The account, written in 1975 by Nicholas Spreckley, then head of the FCO's European department, is a hugely interesting read. Some of the similarities to the situation David Cameron finds himself in are striking, although there are major differences in today's environment, such as a much less deferential media, a greater flow of information, far more actors in the space (including think-tanks), which means the public will be far better placed to assess the success of any negotiations. "The Germans, the Dutch and the Danes seemed the most sympathetic to British objectives...But as so often, it was the French attitude which was at once the most important and the most critical. In these early weeks the French government took the line that the Treaties and the principles of the Community were inviolable." The most important figure was then German Chancellor Helmut Schmidt, who proved willing and keen to be helpful in addressing British concerns. France, however, was hard work and largely unhelpful. There are also strikingly similar disagreements about the budget, and the UK's contribution to it, the frustration of UK ministers to fundamentally alter the CAP, and so on. There are however some clear differences in approach between then and now. 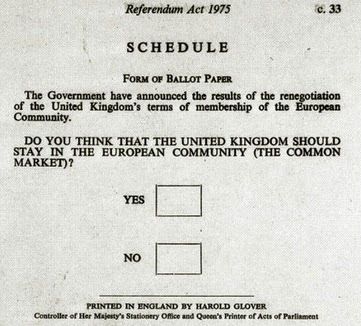 The 1970s negotiators were extremely cautious and ruled out treaty changes at an early stage - due to the small of number of such changes, this was seen as a radical option in the UK and among the eight other member states. However, David Cameron is on the record as saying he wants treaty changes as part of his negotiations. As Sir Stephen Wall writes in his foreword, the "past is a different country", and with over 40 years of collective memory of the EU - added to the famous British cynicism - Cameron is unlikely to be able to pull off the Wilson trick with the British public this time around. Is David Cameron's latest immigration crackdown legal under EU law? David Cameron today announced another 'crackdown' on EU migrants, stating that from November, EU jobseekers "will only be able to claim Jobseeker's Allowance and other key welfare benefits for a maximum period of 3 months." This will halve the current period over which unemployed EU migrants can claim these benefits. The result of this change will therefore be that new arrivals from the EU cannot claim Jobseeker's Allowance for their first three months in the UK but can receive it for three months after that, rather than the six allowed under the existing rules. In addition, a consultation has been launched on banning overseas-only advertising – legally requiring employment agencies to advertise in Britain, and new plans to restrict the number of Job Centre Plus jobs which are automatically advertised on an EU-wide job portal. The European Commission has already said it will investigate whether the changes to the benefit rules are legal under existing EU law (the UK and Commission are already locked in a long-running legal dispute over EU migrants' access to benefits). So, are they? Needless to say No10 and the DWP are confident they are, and we think the Government has a strong case. However, as we noted of David Cameron's last 'immigration crackdown' in November 2013, the UK is at the very limit of what it can do within the confines of EU law. In order to keep this latest measure within the EU rules, it will only apply to new arrivals to the UK who have never worked in Britain. This is because under existing EU rules, people who have worked in the UK must be treated differently because they enjoy 'worker status' for at least six months. As others have noted the impact of this policy on the ground is therefore likely to be small as not many EU migrants will be affected. We have ourselves called for the Government to address public perceptions about free movement, primarily by instilling the principle that EU migrants should only be entitled to benefits after having made an economic contribution. This is clearly David Cameron's intention and he used today's Telegraph article to make the point: "You cannot expect to come to Britain and get something for nothing." But unless this latest measure is followed up with reform of the underlying EU legislation, the UK Government is in danger of chasing diminishing returns with the risk is that voters simply become desensitised to the flurry of crackdowns that make only piecemeal changes. 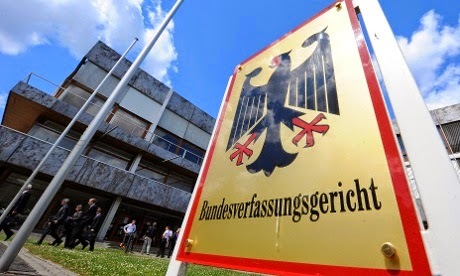 It emerged over the weekend that five German academics have launched another challenge at the Bundesverfassungsgericht – the German Constitutional Court (GCC) – this time against the proposals for a banking union based on the Single Supervisory Mechanism (SSM) at the ECB and the Single Resolutions Mechanism (SRM) at the Commission, with a Single Resolution Fund (SRF) set up via a separate intergovernmental treaty. For background on all these institutions, see these links: SSM, SRM & SRF. That the banking union plans overstep power given in Article 127 TFEU. This is the article which was used to create the SSM in the ECB. Essentially it seems the group take issue with the idea that this could be done since the article refers only to conferring “specific tasks upon the European Central Bank concerning policies relating to the prudential supervision of credit institutions”. The thinking seems to be that, article 127 allows for the ECB to take on certain specific tasks, but not to turn the ECB into the eurozone's single supervisor, giving it complete supervisory control over certain banks and, to an extent, superiority over national supervisors (which some might see as a transfer of power). A key question will be around the amount of power transferred to the ECB. (There is no doubt it has become one of the most powerful institutions in the eurozone crisis both due to de facto action and de jure changes. There are certainly valid questions to be asked here, particularly since the level of democratic oversight is limited due to difficulties in combining this with its strict independence when it comes to monetary policy matters). Although the details are yet to be released, the complaint is also likely to question the legal base of creating the SRM inside the Commission and the pooling of national funds through the SRF. The main questions here relate to the level of control and oversight from the national level, particularly whether the Commission is the right institution to take on this new role and whether it is gaining too much power - not least since the decision was taken under qualified majority voting due to the use of the single market legal base. The group are far from alone in raising legal concerns surrounding the basis for the banking union. As we have previously noted, both the German government and the European Parliament have expressed legal concerns over the structure; the former with regards to the fiscal impact and the legal basis for pooling of funding and the latter with regards to the use of intergovernmental treaties and the circumvention of the EP. (Ironically, such intergovernmental agreements arose in large part to avoid Germany’s original concerns). The German government’s concerns have also been mostly dismissed by the Council legal service previously. The UK Government has also made noises about concerns around the use of the single market article (114) to create a new eurozone architecture. As the FT notes, these cases take some time to work their way through the system and the GCC has shown a track record of generally siding with the EU, albeit often with some caveats. Given said track record and the previous opinions expressed by the Council legal service, we can’t help but feel the outlook is already dim for this challenge. As with all eurozone policies, overturning it would likely cause huge market disturbance and shift the eurozone back towards an existential crisis – something the court is usually quite aware of. That said, the court could add caveats in terms of the democratic assent required for banking union and the role of the Bundestag where funds are concerned. It could also pass the judgement onto the European Court of Justice, as it has done with the case over the ECB’s bond purchase programme the OMT, not least because it seems to mostly question the legality under EU treaties. In any case, this is certainly one to watch and not just from the eurozone perspective. Any ruling could well set a precedent and have a role in determining how far the eurozone can push certain treaty articles in terms of legal bases but also how it fits with national constitutions. In other words, it could be important in determining the issue of euro-ins vs. euro-outs as the EU develops. We are now at the halfway point in terms of nominating the next Commission with 14 out of 28 member states having publicly announced their candidates. The line-up suggests we will have the most senior Commission to date with no less than four former Prime Ministers: Andrus Ansip (Estonia), Jyrki Katainen (Finland), Valdis Dombrovskis (Latvia) and Juncker (Luxembourg) himself. However, as the nifty graphic from EuropeDecides shows, there is a bit of a gender balance issue - only one of the nominees is female. "Looking at the information currently available on the number of female candidates, the commission would not receive the backing of majority in the European Parliament." The magic number is ten - one more than in the current Commission. This would require nine of the second group of 14 Commissioners to be female, which looks unlikely. Below we asses what the prospects are for the remaining member states to put forward female candidates. Belgium: The good news for Juncker is that Marianne Thyssen, who has been an MEP since 1991, is among the front-runners for the post although Berlgium's current Commissioner Karel De Gucht has indicated he would like to stay on. Bulgaria: It was reported that the outgoing socialist government would put forward Kristalina Georgieva, the current Bulgarian Commissioner international cooperation, humanitarian aid and crisis response, if she were to be given the position of High Representative even though she is from the centre-right GERB party. As such, it looks like Bulgaria will instead nominate current Foreign Minister Kristian Vigenin. Cyprus: Androulla Vassiliou is rumoured to be retiring (she will be 71 in November) and in any case is from a different political party to the new government. No word yet on who Nicosia will send in her place. Denmark: No news out of Copenhagen but the centre-left coalition government will likely want to replace Connie Hedegaard who is a conservative politician. France: No formal announcement from Paris so far, but former Finance Minister Pierre Moscovici is the clear frontrunner. Former Europe Minister Élisabeth Guigou is still in the race, but she is broadly regarded as an outsider. Hungary: Although it hasn't been formally announced, rumour has it that Orban will send Hungary's current Foreign Minister Tibor Navracsics to Brussels. 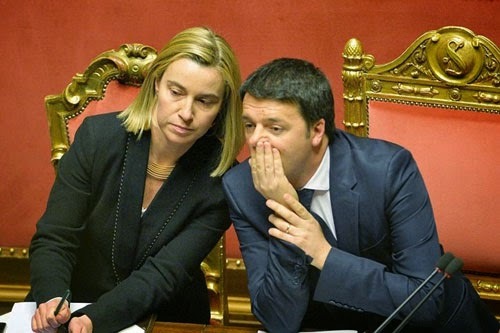 Italy: Prime Minister Matteo Renzi is still pushing for Foreign Minister Federica Mogherini as the new EU foreign policy chief. However, the Italian government would very likely put forward a different name if it became clear that Mogherini will not secure Baroness Ashton's job, and the new nominee may well be a man. Netherlands: The most likely candidate is current Finance Minister Jeroen Dijsselbloem, although it is unclear if he would still go to Brussels if he were not to get the coveted Economic and Monetary Affairs portfolio - something Juncker is reportedly not too keen on. Poland: Poland's two leading candidates are Foreign Minister Radoslaw Sikorski and former Finance Minister Jan Vincent-Rostowski, although there is a lot of speculation that in order to balance the Commission Poland could instead put forward Danuta Hübner, an economist and MEP who already served as the Regional Policy Commissioner between 2004 and 2009. Portugal: According to the Portuguese media, Prime Minister Pedro Passos Coelho is considering picking Carlos Moedas, the Secretary of State to the Prime Minister, as Portugal's nominee. However, Juncker is reportedly putting pressure for the choice to fall on Finance Minister Maria Luís Albuquerque instead. Therefore, Lisbon could potentially nominate a woman. Romania: It appears Bucharest has re-nominated current Agriculture Commissioner Dacian Ciolos. Spain: Former Agriculture Minister Miguel Arias Cañete is the only name doing the rounds in the Spanish media. No real alternatives have been floated. Slovenia: No news out of Ljubljana, where the centre-left won early elections held a couple of weeks ago. A poll out today has found that a majority would like Janez Potočnik, the the incumbent Environment Commissioner, to stay on. Sweden: When it comes to gender equality, you can usually rely on the Swedes. Although nothing has been confirmed, EurActiv reported recently that Cecilia Malmström, the current liberal Commissioner for Home Affairs, might be able to continue even if Sweden elects a centre-left government in September's general elections as looks likely. Our quick headcount reveals that in addition to Vera Jourova from the Czech Republic, we anticipate Juncker can potentially count on another five women (from Italy, Belgium, Portugal, Poland and Sweden) which would only put him on six - still well short of the target. Possibly MEPs could accept a lower number if a woman were also appointed as President of the European Council but not this low. If the European Parliament were to follow through on its threat to veto the entire Commission it would set up an unprecedented row with member states, some of whom would have to back down over their preferred choice of Commissioner (although the UK would probably be safe given the appointment of Baroness Ashton to the current Commission). Normally when the EP generates these kinds of threats and ultimatums (like over the MFF last year) some kind of backroom deal is usually stitched up allowing everyone to save face but it is increasingly hard to see where Juncker will get enough woman from to placate the European Parliament. Whenever EU reform and renegotiation are being debated, one of the most powerful claims made by the status-quo side is that it would generate uncertainty which would be bad for business. Well today's FT reports that according to a survey of one in three FTSE100 chairmen conducted by Korn Ferry, a leadership and talent consultancy, the overwhelming majority - 81% - said the want to see the UK renegotiate its relationship with the EU. In comparison, only 15% back staying in no matter what and 4% supporting an outright exit. There was naturally a range of views in terms of how far-reaching the renegotiation ought to be; some business leaders backed only "limited" changes, but a clear majority - 63% - backed "a return of social and economic power to nation states". Although the business support for EU reform is not surprising - as our own pan-European business campaign for EU reform showed - the extent of support is considerable. This is particularly true since it comes from large corporations, which are often seen as gaining greater benefit from the current EU set up than small and medium sized enterprises, which bear a disproportionately larger burden from EU regulations. With such a strong mandate from business, it really is time for Cameron to ramp up his push for reform and flesh out exactly what kind of reform is desired, and how it can be achieved. The EU's possible new sanctions on Russia: What 'burden sharing'? As we noted in our previous blog on the potential 'Stage 3' of EU sanctions on Russia, the options considered by the European Commission and the EEAS seem heavily focused on financial markets, raising the question of whether London would have to shoulder too much of the burden. Between 2004 and 2012, a total of USD 48.4 billion was raised through IPOs in the EU by companies incorporated in Russia. Out of those, USD 16.4 billion was issued by state-owned financial institutions. In 2013, 47% of the bonds issued by Russian public financial institutions were issued in the EU's financial markets (€7.5bn out of a total of €15.8bn). However, what the memo does not say is that all those deals took place in London - as data from the London Stock Exchange show quite clearly. 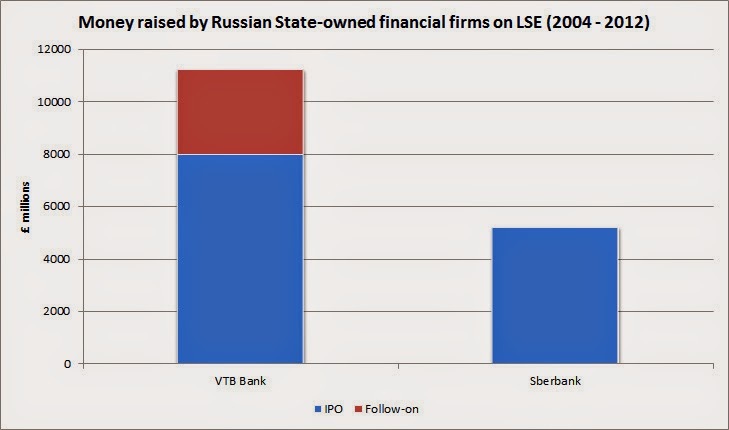 As the graph above shows, VTB (twice) and Sberbank have raised $16.4bn from IPOs (and follow on issuance) in London. This seems to correspond (or even outstrip) the figure cited in the EU document. Furthermore, the total value of IPOs from Russian firms also comes from London, since it stands at $48.96bn (between 2004 and 2012). The spread of debt securities seems a bit wider, and data are harder to find. However, it is a good bet that quite a few were issued or at least cross-listed in London. Ultimately, this is not 'make-or-break' for London. The fees from debt and/or equity issuance and stock listings are a nice income, but not huge in terms of the City. We would expect the figure to be within the hundreds of millions maximum. It's also worth remembering that any sanctions are likely to be only forward looking so relating to new debt and equity issuance not existing stocks (although this is still up for grabs in the negotiations). Hence, as we asked in our previous blog, the real question is why is so much of the burden (even if it is not a massive one) falling on the UK? France and Germany might be talking tougher, but they do not quite seem to be following through with actions. *(Update: We have seen an updated version of the document which has the exact $16.4bn figure, and so have updated it in the text above). The section on capital markets is by far the most detailed. This raises the question of whether the UK would be taking a larger share of the burden. This is possible, and the document does not provide national estimates in terms of costs. However, as we have pointed out many times, the links between the City of London and Russia are not as huge as is made out. The draft paper stresses that financial links come from around the EU, seemingly confirming this analysis. Reuters notes that the four largest Russian banks with state ownership of over 50% are Sberbank, VTB, the Russian Agriculture Bank and VEB. 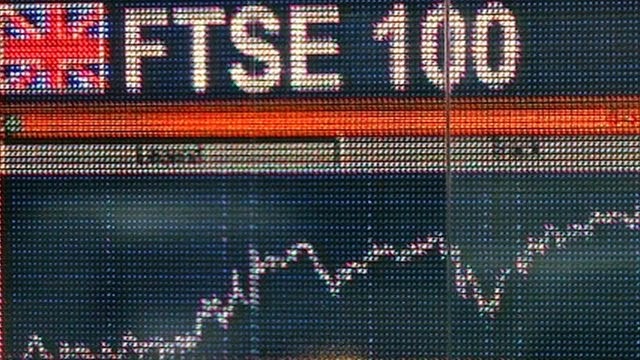 The first two are listed on the London Stock Exchange. It is not clear what these sanctions would mean for companies such as Gazprombank, which is 100% owned by Gazprom - which in turn is 50% owned by the Russian state. That said, one has to question the level of burden-sharing taking place under these proposals. 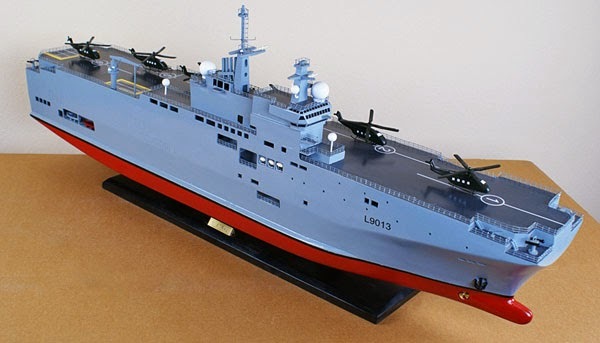 It seems France would put up almost nothing, as it could achieve a specific carve-out to guarantee that previously agreed arms deals – such as its €1.2 billion Mistral warship sale – are exempted. Once all the caveats are considered, the arms embargo seems essentially pointless. It would also have little impact on Russia since it imports barely any EU arms. The impact of all this on Russia would be mixed. The financial sanctions could have some impact but it would likely be a drawn out one. They would force companies to shift to much shorter financing and force the state to back them up even further – a blow but not a killer one. Linked to all this is the issue of international cooperation. For example, refinancing the €7.5 billion of bonds issued (in 2013) by Russian state-owned banks on EU markets would not be prohibitively difficult if markets in Singapore and Hong Kong are still open to these firms. Similarly, in terms of high tech imports, there may be alternatives on offer. At least on this front, Japan, South Korea and others are unlikely to turn against the West. Of course, the role of China is important. Beijing may help Moscow out (particularly on the finance front), but probably not to the extent Russia is hoping. China is keen to keep its holdings and investments diversified, and also has a lot invested in Russia. The fact that all of the sanctions are only forward-looking is also a big caveat, and allows both sides time to diversify away. Hence, the final question to ask is whether this document will bolster the threat of EU sanctions. In some areas yes, in others no. For example, the detail on financial sanctions will be welcome, although it is unlikely that Putin will be shaking in his boots. On the arms, tech and dual use side, though, the lack of clarity and the number of caveats could actually undermine the EU’s position and would once again highlight how hard it would be to actually reach unanimity to move to 'Stage 3' sanctions. The document is still being negotiated. We will update our blog as and when we hear of new developments. The report also echoes Open Europe's recommendation that if further liberalisation cannot be achieved at the EU28 level, a group of like-minded member states should push ahead using the so-called 'enchanced co-operation' mechanism. "The value of expenditure in the budget, where in particular... on research and innovation, was seen as a priority for a greater share of the budget, although views were also heard in support of structural and cohesion funds, particularly in poorer Member States. The value for money of the Common Agricultural Policy (CAP) was questioned by a large proportion of respondents, with particular concerns about the value of Pillar One of the CAP." "support for the general principles of cohesion policy and the need to provide support particularly for poorer Member States, was shared by many respondents... The evidence as a whole is inconclusive but where significant positive impacts have been identified, they tend to have been in the poorer regions or Member States." "A key question is whether structural funds should be used in richer regions of Member States, given the alternative sources of funding available, the more limited additionality and the goal of reducing disparities. This was sometimes expressed in terms of concerns about paying money into the EU only to get it back with conditions attached. Many respondents recognised that the UK might be better off financially if it did not contribute to cohesion policy in rich Member States or regions." "Finally, it is important that funds available for cohesion policy are well managed. However, the complexity of rules and the perceived burdens of applying for, reporting on and auditing projects are potential barriers to the effectiveness of the structural and cohesion funds." "There was mixed evidence on the case law of the ECJ; while some considered that the ECJ has simply upheld fundamental rights, others considered that some of its judgments have undermined national sovereignty and the EU’s legislative institutions... in comparison to other human rights protections in domestic law, fundamental rights can have a wider scope and can result in the disapplication of primary legislation. Therefore, with an increasing domestic awareness of EU fundamental rights, the evidence suggests that their impact will increase." Compared to the first two stages of the BoC which were rather underwhelming, this third tranche of reports has at least been more explicit in identifying some of the most pressing challenges that need to be addressed while - for the most part - steering clear of setting out solutions. Today, the UK Government has published the third batch of its reports reviewing the ‘Balance of Competences’ between the UK and the EU. We have noted before that many of the previous reports, whilst interesting on much of the detail, have for various reasons turned out to be rather disappointing and dodged the major questions facing Britain in the EU, so how do today’s tomes compare? "Whilst there is broad consensus that highly skilled migrants from the EU have been beneficial to the UK, there is less agreement regarding low skilled migration, with some arguing that gains for employers are offset by negative impacts on the lowest paid workers." "The scope of free movement rights has now expanded beyond their original intention, and is no longer limited to economic factors." "Successive judgments by the ECJ have interpreted the right to free movement set out in the Treaties and the Free Movement Directive broadly, with the consequence of expanding the rights of entry and residence which may be asserted in reliance upon them, and consequently restricting Member States’ competence in this area." 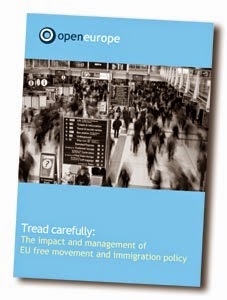 Other concerns expressed were criminals' exploitation of the rules, the localised impact on public services, and falling public confidence in the concept of free movement. "The Government considers that now is an appropriate time to review the EU level rules with a view to modernisation and ensuring they are fit for purpose in the EU of today. The rules have evolved beyond the original scope as the EU has evolved and the interaction between rules on residence and social security coordination becoming increasingly complex. This complexity has led to an increasing number of challenges through the ECJ, creating uncertainty and, in the majority of cases, weakening the ability of Member States to determine how their systems operate." "Without reform, legitimate public concern about how EU migrants access social security in other Member States is likely to significantly undermine support for the principle of free movement." This is the most explicit any of the BoC reports has been about the need for reform and, while there is no settled policy prescription (the report discusses OE's and David Goodhart's reform proposals at length), the key issues have been clearly identified. This is apparently the third iteration of the report, following several rounds of coalition ping-pong. Nevertheless, it highlights the degree of cross-party consensus on the need for reform of benefits rules - which Labour has also called for. It would however be intriguing to know what was cut in the various edits. We will be leafing through the other reports published today and will return to them on the blog later this afternoon. EU foreign ministers will meet tomorrow to discuss what to do with Russia in light of last week's MH17 plane crash, where almost 300 people lost their lives. The option of moving to tougher 'Stage 3' economic sanctions will be on the table. While the UK, France and Germany have all warned Moscow that it will face further sanctions if it fails to secure the crash site and guarantee a thorough and independent investigation, all eyes are on Italy and Spain - usually among the most dovish member states when it comes to EU-Russia relations. "If Russia doesn't cooperate with the investigation [into the crash], we are very much ready to support the sanctions." Belated compared to other big EU countries, but this is the most strongly worded statement coming from Rome to date. One could expect Italy to take a tougher stance this time around, not least because the main objection raised by Eastern European member states to the appointment of Italian Foreign Minister Federica Mogherini as the new EU foreign policy chief is precisely the fact that Italy is regarded as too soft on Russia. Meanwhile, speaking to the press this morning, Spanish Foreign Minister José Manuel García-Margallo took a milder position. He refused to condemn Russia for the crash, and suggested waiting for the outcome of the investigation by the International Civil Aviation Organisation (ICAO) before considering any further steps. On top of this, despite presenting a united front, Germany, France and the UK might not yet be on exactly the same page - not least because France continues to look unwilling to put its sale of Mistral ships to Russia on the table, and Germany's prime concern seems to be to preserve cohesion within the EU, rather than driving tougher sanctions. The big EU member states are therefore still not all on the same wavelength - although the fact that Italy might be hardening its stance is an interesting development. Once again then, it is far from granted that EU foreign ministers will be able to agree on tougher sanctions on Russia tomorrow. However, it is looking the most likely it has been for some time. EU leaders fail to agree on the remaining top jobs. Anything to remember from yesterday's summit? Yesterday's European Council summit ended without an agreement on the remaining EU top jobs. However, something interesting still came out of the meeting. EU leaders appear to have established that the next High Representative for EU foreign policy will be a centre-left politician. German Chancellor Angela Merkel, French President François Hollande and Italian Prime Minister Matteo Renzi all said it in the respective post-summit statements. Renzi, who is pushing for Italian Foreign Minister Federica Mogherini to get the job, also stressed that, "Everyone agrees that there's no other candidacy than Italy's." Hollande added that the High Representative "will necessarily be a woman, taking into account the image of Europe we have to offer". The French President also made clear that he backs Mogherini's candidacy. As Hollande put it during his press conference, the next European Council President "will be a personality that will have to gather consensus". Similarly, Merkel said, "We need a personality...who can hold us 28 together." "Hollande said that, according to him, the next European Council President has to be one of the 28 [sitting EU leaders]. It doesn't matter whether [he/she is] from the eurozone or not. He got broad support [for this idea]." Speaking after the summit, Polish Prime Minister Donald Tusk confirmed that his name has been informally floated for the post of European Council President (an option we discussed here and here), but that he had not been approached officially. "We have to play out a complicated game and sometimes in this game the argument goes that all options remain on the table. Therefore, if you ask me if this is impossible, I will say that in the negotiations I prefer to keep every eventuality in reserve in order to achieve the maximum that Poland could possibly achieve." And that was it. EU leaders will meet again on 30 August to try and wrap up a deal. We will be monitoring the meeting very closely, despite it being on a Saturday. Will Tusk take over from van Rompuy, and what would it mean for Cameron? Yesterday, we reported that Italian Foreign Minister Federica Mogherini's bid to become the next EU High Representative for Foreign Affairs has run into trouble due to her perceived lack of robustness vis-a-vis Russia and Putin, with around ten or eleven countries - mostly from central and eastern Europe - opposing her candidacy. We argued that one way to try to square the circle would be to appoint someone from that region as European Council president to replace Herman van Rompuy, with Polish PM Donald Tusk the most credible candidate. It is understandable why this 'dream ticket' could generate widespread support - it ticks a number of boxes; at least one top post goes to a woman, one to someone from central and eastern Europe, an experienced politician as European Council President and a relatively junior one as High Rep. 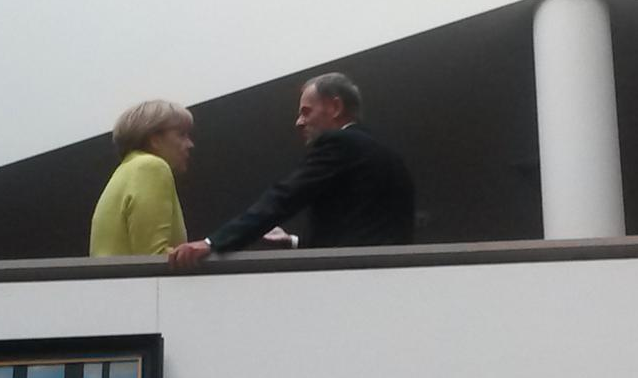 It is clear why Merkel - who has good relations with Tusk - is pushing his candidacy. So why is Tusk resisting? Well, the main reason - aside from his lack of language skills - is that he has no immediate successor as Polish Prime Minister (not least because he has culled any potential challengers) and Polish domestic politics are particularly precarious in the wake of the Wprost tapes scandal. Law and Justice are currently leading in the polls and it is not clear whether the government would be able to hang on without fresh elections in the event of a Tusk departure. Moreover, Tusk himself feels he still has unfinished business in Poland. 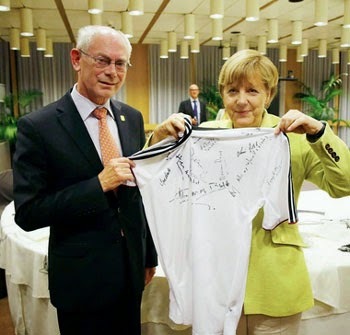 Nonetheless, Mutti can be very persuasive so it cannot be completely discounted, and van Rompuy's successor does not take over until November, which leaves a bit of time for a transition. Given that the role will be very important in broking David Cameron's potential renegotiation, what would it mean if Tusk got the job? Well let's start with the positives - like the UK, Poland is a non-euro country so shares concerns about eurozone integration potentially disadvantaging non-euro members. Poland is also economically liberal and backs further expansion of the single market and the EU-US free trade deal (TTIP). Poland and the UK have also been close allies on Energy issues and with Russia having emerged as a common concern, both recently worked together to push the EU to adopt a tougher position on Russia. Finally, if Tusk were to get the job, he would be keen to stay close to Merkel, something Cameron could use to his advantage. However, on the whole, a Tusk Presidency may not be good for Cameron; the two have a strained relationship, exacerbated in recent times by the row over EU free movement and Cameron's (ill-advised) comments about Poles claiming UK benefits (Tusk's former spokesperson Pawel Gras claimed the Polish PM had a proper f****** go at Cameron over these). Moreover, while Cameron and Tusk may agree on specific issues, Tusk is dismissive of Cameron's broader argument that the EU is need of fundamental reform and he is therefore unlikely to go out of his way to help him get significant concessions - Cameron would therefore need to ensure he has enough support among other national leaders to negate this factor. In the past month there has been a lot of pushing and shoving over the eurozone's fiscal rules (see here). While renegotiating the Stability and Growth Pact seems off the table, French President François Hollande and Italian Prime Minister Matteo Renzi have been calling for more 'flexibility' in the application of eurozone fiscal rules - leading a whole host of German politicians to see red. Whether or not more flexibility may be granted to member states in the future will in part be decided by the next EU Economic and Monetary Affairs Commissioner. As we've pointed out here, the two front runners for the post for the post are French Economy Minister Pierre Moscovici and Dutch Finance Minister Jeroen Dijsselbloem. 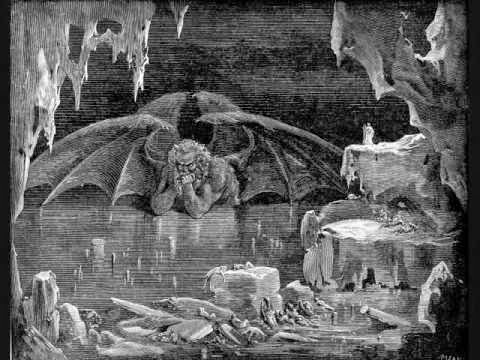 “If you appoint exactly that French Finance Minister [Pierre Moscovici] to the position of the EU Economic and Monetary Affairs Commissioner, who has done nothing to comply with the Stability Pact, that is as if you wanted to cast out the demons with Beelzebub." Bartle could have stuck to the good old "putting the fox in charge of the hen-house", but when CDU politicians resort to the bible to argue their case (Matthew 12:27), you know it's getting serious. Martin Schulz's revenge: Will the European Parliament block the UK's EU Commissioner? If you read our press summary this morning (if not, do sign up!) you would have seen - before anyone else outside Germany incidentally - that Lord Hill, the UK's nominee for EU Commissioner, is already at risk of becoming a victim of an increasingly assertive European Parliament. 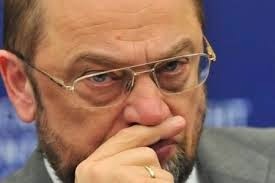 Martin Schulz – the ‘European Commission Presidential candidate’ who was re-selected President of the European Parliament after his socialist group in the EP came second in the European elections - was made persona non grata by Labour in the run-up to the European elections. He was seen as too federalist, and someone who would only give Ed Miliband additional headaches shortly after Labour ruled out an In/Out referendum. He’s had a rough ride in the UK over the Spitzenkandidaten, where he clashed head on with the Tories and most other British people. He may now take his revenge. "I cannot imagine that, with his radical anti-European views, provided that he has them, [Lord] Hill can get a majority in the European Parliament…It will become clear if Mr Hill approaches us without prejudice, and that will certainly influence whether or not he gets a majority." The European Parliament cannot formally reject individual Commissioner-nominees, but can veto the entire European Commission. Therefore, MEPs have de facto 'blackmailing powers' to pick off individual nominees. Interestingly, Schulz added that a rejection of Lord Hill in such a way "cannot be ruled out". "David Cameron has proposed the eurosceptic Jonathan Hill as [the UK's] next EU Commissioner, and [he's] a determined sceptic of the euro and the EU. Can one assume that the next EU Commission will become significantly more eurosceptic, blocking things from the inside?" So, is this posturing or is Schulz meaning business? Well, as for now, we should treat the comments with caution. Even if Schulz is serious, he will need to get a majority of MEPs to agree that Hill should be rejected on basis of "radical anti-European views, provided he has them". Hill isn't exactly on record spewing out Farage-type anti-EU slogans. The point about Lord Hill is that he's a very different type of political operator altogether: he's someone who strikes deals, rather than engaging in shouting matches or trading in platitudes. Schulz will struggle to build a case on this one - not least since Lord Hill seems like exactly the type of pragmatic, deal-maker type person MEPs should like. Still, it's a strong statement from Schulz. This morning, Brussels watchers, virtually in unison, typed the following name into Google: Lord Hill. David Cameron’s long-awaited nomination for the UK’s next European Commissioner was hardly a household name. In 2009, Gordon Brown nominated Baroness Ashton for the post – the then leader of the House of Lords, known to few people outside of Westminster. As it turned out, Ashton grew in the role and will leave Brussels with a relatively good reputation. 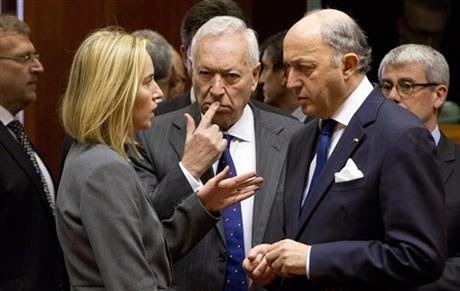 The main problem was that Asthon’s position – EU foreign affairs chief – meant long absences from Brussels. This proved critical as, whether we like it or not, working the Brussels corridors and getting stuck into the agenda-setting “College of Commissioners” are absolutely vital if the objective is to make as many EU proposals as possible come with a UK flavour. Some people hate this stuff – including William Hague who just refused to go anywhere near the role despite being the most obvious candidate – but others thrive on it. I was always in favour of Cameron sending a high-profile figure to Brussels. It would have sent a strong signal that EU reform is for real and improved the likelihood of the UK getting a top economic job – internal market, competition or trade. Lord Hill lacks the obvious external gravitas and high profile, so in that sense, his appointment has reduced the chances of the UK getting a top job. 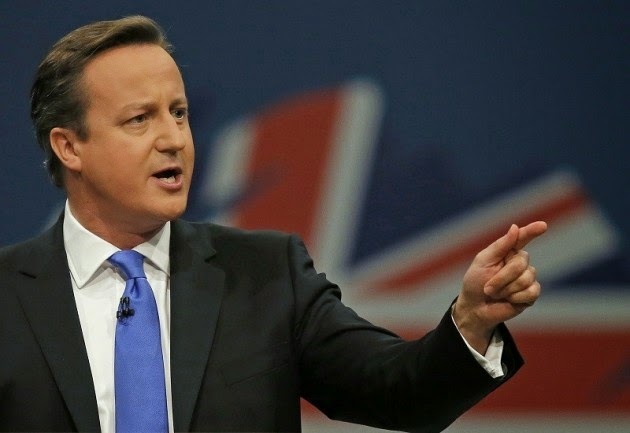 Cameron has been criticised for not sending a sufficiently strong signal of intent. However, not least since I expect several portfolios – including internal market – to be broken up or altered, the job allocation is unusually unpredictable, and we shall have to wait and see. Also, sending someone with a lower profile may work in the UK’s favour. 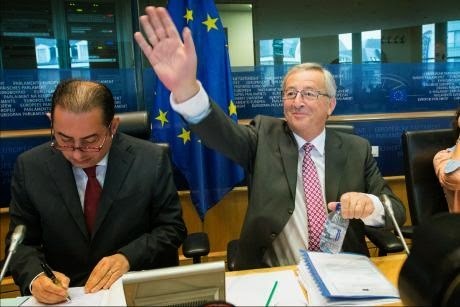 A heavy hitter – particularly with a Eurosceptic reputation – in combination with a big portfolio may have been too much for EU partners and Juncker to swallow, not to mention the European Parliament. 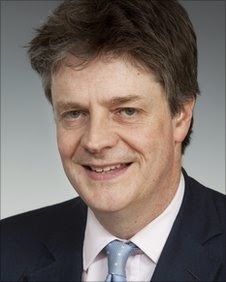 And Lord Hill is hardly a novice, having worked across departments and at the heart of government, including as Chief of Staff to John Major, during which he was involved in negotiating the Maastricht Treaty. On making EU reform happen – which remains the key objective – Lord Hill is a clever operator with a fantastic reputation in Westminster circles. Brussels is a very different place to Westminster, but if he can replicate his operational style over there – winning people over, striking deals – then perhaps he’s exactly the type of person the UK should be sending. Opting for a Viviane Reding-type, who does a lot of shouting but achieves little, wouldn’t be ideal either. There's still no denying that choosing someone less known remains a gamble. But Lord Hill may yet surprise plenty of people both at home and abroad. UPDATE (18:20) - The FT's Peter Spiegel and Alex Barker are reporting that Belgium's Karel De Gucht, currently serving as EU Trade Commissioner, could be a late entry into the race for High Representative. Like former Estonian Prime Minister Andrus Ansip (see below), De Gucht is a member of the liberal ALDE family - that has joined the 'grand coalition' supporting Juncker in the European Parliament and now looks to be asking for something in return. EU leaders will meet in Brussels tomorrow to get on with the assignment of the remaining top jobs. Priority will probably be given to the appointment of the EU's new foreign policy chief (aka High Representative for Foreign Affairs and Security Policy). Italian Foreign Minister Federica Mogherini is still regarded as the frontrunner for the job. However, things may not go as smoothly as initially thought. Sources close to European Commission President-elect Jean-Claude Juncker have told Italian news agency ANSA that "ten-eleven [EU] countries" are currently against Mogherini's appointment. The sources didn't name any names, but it is understood that Eastern EU member states are particularly reluctant, since they believe Italy did not take a hard enough stance against Russia during the Ukraine crisis. "[The appointment of] Juncker is part of an agreement whereby the High Representative goes to the socialists." "Juncker has been designated by [qualified] majority. No-one ever raised objections [against Mogherini] with us. If there were any, that would mean the High Representative will also be designated by majority." Therefore, things may be heading towards another showdown. This time, though, the outcome of the vote could be a lot more uncertain. A group of ten or eleven countries (very likely to include Poland, a qualified majority heavyweight) would have good chances of success in forming a 'blocking minority' to reject Mogherini's appointment. That would be a blow for Italian Prime Minister Matteo Renzi, who seems to be investing a good deal of political capital trying to secure a post that he considers as of great prestige. But it could also shift the balance in the distribution of the other top jobs - notably the Presidency of the European Council. Mogherini is from a centre-left party. This means her appointment would make it less likely for Danish Prime Minister Helle Thorning-Schmidt, another centre-left politician, to succeed to Herman Van Rompuy as European Council President. However, this argument could no longer be valid if the new High Representative were to come from a centre-right party. This would be the case with Bulgaria's Kristalina Georgieva, who looks to be gaining momentum as an alternative to Mogherini, although, as our dove-hawk axis showed, Bulgaria has so far also been quite soft on Russia. Another option could be to offer the post of European Council President to someone from an Eastern European country in order to assuage opposition to Mogherini. Polish Prime Minister Donald Tusk could be an option, although with Polish domestic politics in a precarious state he may prefer to stay put. In that case, former Estonian Prime Minister Andrus Ansip - who has already been nominated as Estonia's next EU Commissioner - could be one to watch. Ansip's Estonian Reform Party belongs to the liberal ALDE group, that has joined the 'grand coalition' supporting Juncker in the European Parliament and would presumably be keen to get something substantial in return. In other words, a few surprises may come out of tomorrow's European Council. Stay tuned. The most visited Wikipedia page from Brussels IP addresses today will be Lord Hill's - the UK's European Commissioner nominee. 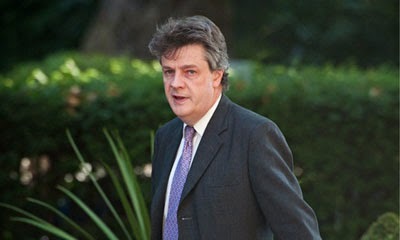 Lord Hill is currently the leader of the House of Lords. We have previously argued that David Cameron should "send forth to Brussels the best he has." The reason is simple: reform is fundamental to the UK's EU membership so the UK should put forward its best candidate to secure one of the 'big jobs' in the Juncker Commission and maximise the chances of negotiating success on all levels. In 2009 Gordon Brown made a serious mistake in coming late to the game and sending a little known Peer, Cathy Ashton (also leader of the House of Lords incidentally) and ended up with a job that nobody else wanted. Have the lessons been learnt? Well, Cameron certainly hasn't sent the guy with the highest profile, instead prioritising avoiding a by-election, but it's too early to tell whether Lord Hill will sink or swim. He could turn out great. But who is Lord Hill? "Non, non, non. First, I don't believe I'm going to be asked. Secondly, I like it here. I quite like it at home, in the British Isles." That's not the first time a politician has said something similar and ended up in that very position, though. Lord Hill is definitely well connected in the PR industry and knows the Conservative party. He knows the political system and the art of political public relations. Plenty of people say he's a 'fixer' who can work the corridors in Brussels - something which Cathy Ashton wasn't able to (partly because of her job which involved long absences from Brussels). It's too early to jump to conclusions. 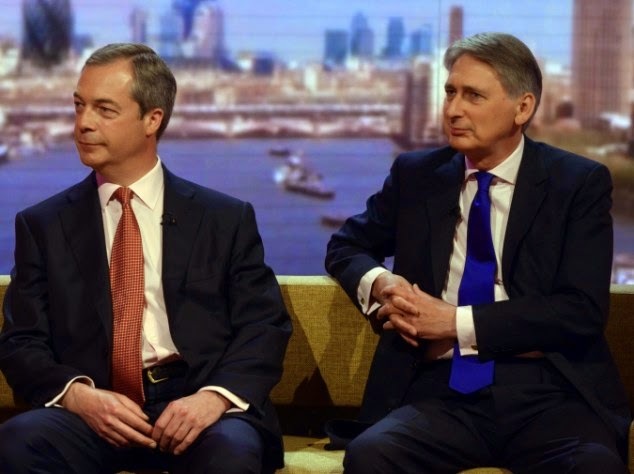 Hammond: Will he win back UKIP voters to the Conservatives? "If the choice is between a European Union written exactly as it is today and not being a part of that then I have to say that I'm on the side of the argument that Michael Gove has put forward. I believe that we have to negotiate a better solution that works better for Britain if we are going to stay in." "I believe that we have to negotiate a better solution that works better for Britain if we are going to stay in and play a part in the European Union in the future, but let me be absolutely clear: I think it is defeatist to sort of say we want to leave the European Union." "We should say no, this is a club that we are members of, and before we talk about leaving it, first of all we're going to try and change the rules and change the way it works and change the objectives that it has in order to make it something that works for Britain." Is this a big deal? Well the logic of the Conservative position has always been that advocating an 'in' vote is dependant on achieving reform. Therefore stating the opposite - that no reform might lead to an 'out' is not that much of a revelation - Cameron himself has said a UK exit would be "imaginable". However, the key question is the threshold - how much needs to change for a Tory to vote Yes (In)? And Hammond definitely has a higher threshold than Hague. Pointing out the obvious may have its advantages. If EU reform is to happen to the extent needed to persuade the British people to stay in the EU, other EU leaders need to understand that it cannot be tokenistic. In that sense, Hammond's appointment sends a clear message both at home and abroad - reform is not just desirable but fundamental to the UK's EU membership. It will also have political benefits for the Conservatives. Hammond will now see the Conservative's EU policy through to the 2015 election and, assuming they win, attempt to force the actual reform agenda through before taking a leading role in the referendum. Having a figure who has said that reform must be substantial for him to back an 'in' will add credibility to their election campaign and help win back voters who have left to vote for UKIP. But we think it's fair to say that Hammond is the most eurosceptic Tory Foreign Secretary since Viscount Halifax in 1939. 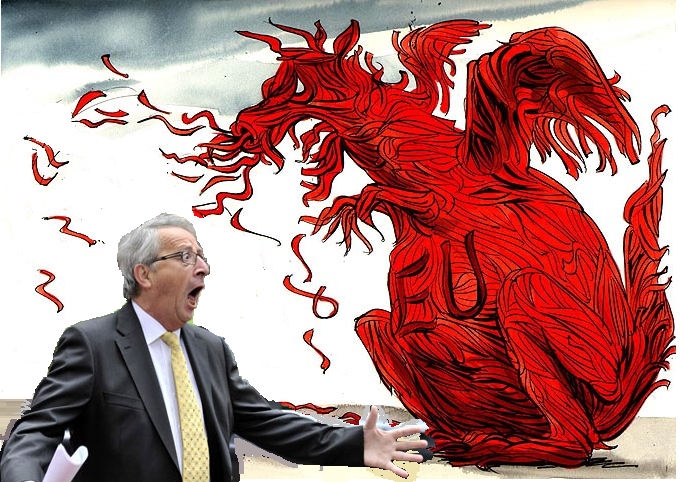 Is Juncker saddling up to take on the EU's red tape dragon? This is a welcome suggestion - we floated a similar idea back in our "EU localism" report back in 2011, and the Dutch subsidiarity review also recommended a 'subsidiarity commissioner'. Of course Juncker is not be the first person to say they wish to EU cut red tape and he will most likely not be the last. However, this is an encouraging sign, and suggests that he is not totally deaf to the concerns of business and citizens. To make the idea more than symbolic, Juncker will need to do more than create a new post. The new Commissioner will need to be able to reach across the EU Commission's many departments and force other Commissioners to move forward with scrapping redundant laws. Specific tools could include the imposition of sunset clauses into new legislation and the right to demand updated impact assessments for existing regulations (UK government impact assessments often projected benefits which failed to materialise). For all this to take place, there will need to be a cultural shift in the Commission. If this is a genuine attempt to de-regulate, Juncker will be able to count on support from UK, Scandinavian, Central and Eastern and Dutch governments. However, Juncker himself has also talked up the need for the EU to be more involved in social policy so it remains to be seen how strong his commitment to de-regulation will actually be. So this is a welcome idea but one that needs full support and back-up across the EU in order to fly. What sparked yesterday's renewed concerns around the eurozone? Over on his Forbes blog Open Europe's Raoul Ruparel provides a comprehensive analysis of the renewed concerns around European banks, centred around Banco Espirito Santo (BES), which saw stocks falling across Europe yesterday. The full post is here and reproduced below. The ownership structure is a mess. 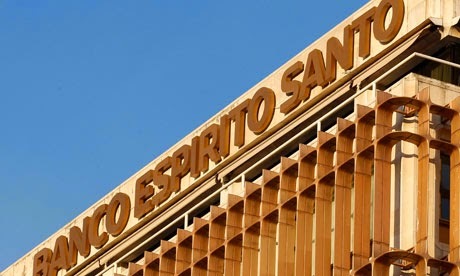 BES is 25% owned by Espirito Santo Financial Group, which is 49% owned by Espirito Santo Irmaos SGPS SA, which in turn is fully owned by Rioforte Investments, which is fully owned by Espirito Santo International (last two are based in Luxembourg). The exposure between these level is equally opaque, with the WSJ highlighting back in December that ESI was utilising different branches of its structure, including BES, to fund itself up to the tune of €6bn. Currently, BES has admitted it has the following exposure: €980m debt from Rioforte, but it also helped place €651m of debt issued by Rioforte and ESI to retail customers and €1.9bn to institutional clients. This debt could essentially be worthless or massively written down. It’s not clear how open BES was about its conflicts of interest and if it mislead buyers. There is a serious risk of lawsuits here. Citi has put potential total losses at €4.3bn, this could wipe out BES capital buffer and force it to raise a similar amount again. BES also has a worrying exposure to its subsidiary in Angola which is draining €2bn worth of funding. This is substantial for a bank with a €6bn loan book. The bank has also required a 70% guarantee from the Angolan state, which itself has a poor credit rating meaning the usefulness of such guarantee may be limited (the fact it was needed at all says a lot). This has also been weighing on the share price. All this culminates into some very real concerns. While there are plenty of unfounded rumours flying around, the fact is they are hard to disprove because the structure of the bank and its affiliates is so maddeningly complicated. The exposure has also been continuously underestimated and hidden so it’s only right to ask, what else might they be hiding? The market has pulled too far ahead and was looking for an excuse to pull back. The market is also in a bit of a price discovery phase, still trying to figure out how to balance the issues of low inflation, search for yield, remaining eurozone risks and future ECB action, so it can be prone to sharp moves. The lower volumes and liquidity in certain markets may also exacerbate the move. Lastly, with the recent market convergence, there is bound to be more spill over between and within markets. All to say, part of this may be the confluence of market factors and circumstances – such a situation can last but is more likely to be temporary. More importantly though, investors are realising that, if the bank got into trouble it would have to rely on its sovereign for help. The bank cannot afford to recapitalise to the tune of €4bn. Equally though, Portugal (in the midst of trying to find further budget savings) would struggle to stump up the cash – hence the sovereign spill over. Talk of the sovereign-bank loop being broken are seemingly premature (as I have said before). On top of this, investors are also looking at a lot of uncertainty about how a bailout/bail-in might work and what the exact rules would be. The eurozone’s rules on bank bail-ins and the single bank resolution mechanism don’t kick in for some time and while the state aid rules make it clear investors will take losses the exact format is very uncertain. These two points should once again peak investors’ concerns about how such bank resolutions might be handled. Throw the political obstacles in the mix surround a national flagship bank such as BES and one might wonder how much has really changed since such questions were asked at the peak of the crisis. More generally, BES’s problems show some elements indicative to periphery banks (particularly in Portugal and Italy). It has a very old, complex and opaque structure and its exposures are still not well known. Too little attention has been paid to this in the past year. The loan books are also weighed down by investments and lending to zombie firms. Let’s not forget, these two countries did not suffer from bubbles but chronic low growth and high corporate debt levels – neither of which has been tackled. There are clearly some lessons in this situation for eurozone investors and they would do well to remember the short comings in the eurozone architecture, particularly when it comes to the banking sector which is yet to be cleaned up even after six years of crisis. That said, given the specific nature of the problems it is unlikely to mark a huge turnaround in market sentiment. Sure, the market will pull back a bit but we still have the injection of the new ECB lending operations (TLTRO) to come and the hope of some positive data on the GDP and inflation front. One final point out of all of this is to watch how BES does in the upcoming ECB Asset Quality Review (AQR) and bank stress test. If it is not seen to have been rigorously assessed and problems highlighted then serious questions will begin to be asked about the credibility of an exercise. Now, the failure of the AQR would really be the start of bigger problems for the eurozone. "Mr. Juncker will have to present concrete ideas over how he will address the massive investment gap, the creeping de-industrialisation of Europe and the social distortions. We will not be won over with empty phrases or with recycled ideas. There is too much at stake for people to do that." We're not sure how confident Mr. Bullman can be, given that Juncker gave a masterful display of how to be all things to all men and women, finding the right things to say to placate everyone from conservatives to communists. Here is an overview of some of the highlights. Juncker: Why do you call me a federalist? I am not a federalist. I do not believe in the United Staes of Europe. #ALDEasksJuncker Juncker will push CCCTB (common tax base). Juncker: I am not saying I am a proponent or opponent of austerity, but I do like budgetary rigour. You can't spend what you don't have.
.@JunckerEU : "for budgetary rigour, against excessive austerity" when does "excessive" start? "On the composition of the Commission, we note his statement during our hearing that no portfolio has as yet been attributed to any particular Commissioner or political family, not least the portfolio of economic and monetary affairs  in contrast to what has been reported as having been said to the S&D Group." "We need to diversify our energy sources, and reduce the energy dependency of several of our Member States... we need to strengthen the share of renewable energies on our continent... It is, at the same time, an industrial policy imperative if we still want to have affordable energy at our disposal in the medium term." #Juncker tells Greens he's wary of fracking because "I tend to be cautious even if that's old-fashioned. I don't rush into new technologies"
He also endorsed EU enlargement to the Western Balkans while coming out against "any specific enlargements" within the next few years. While his desire to build bridges is commendable, on many key issues he ended up either sitting on the fence or espousing outright contradictory positions. Will the real Jean-Claude Juncker please stand up?